Half (50%) of all Latinos say that the situation of Latinos in this country is worse now than it was a year ago. This pessimism is especially prevalent among immigrants, who account for 52% of all Hispanic adults in the United States. Fully 63% of these Latino immigrants say that the situation of Latinos is worse now than it was a year ago. In 2007, just 42% of all adult Hispanic immigrants—and just 33% of all Hispanic adults—said the same thing. Hispanic registered voters, all of whom are U.S. citizens by birth or naturalization, are more similar to all native-born Hispanics than they are to Hispanic immigrants in their level of pessimism about how things are for Latinos. 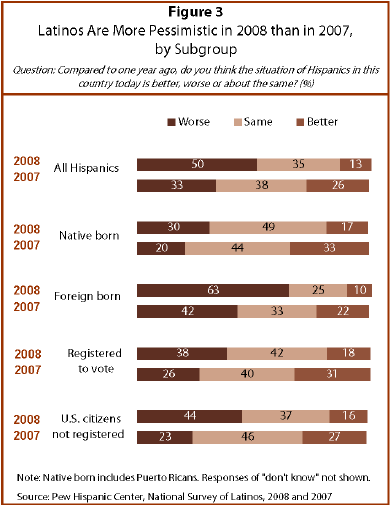 Nearly four-in-ten (38%) of Hispanic registered voters say the situation for Hispanics has gotten worse. Hispanic registered voters who identify with or lean toward the Democratic Party (41%) are more pessimistic than are Hispanic registered voters who identify with or lean toward the Republican Party (27%). Hispanics who have lower levels oeducation and income are more likely than Hispanics with higher levels of education and income to say that the situation for Latinos is worse than it was one year ago. More than six-in-ten (63%) Hispanics with less than a high school education, compared with four-in-ten Hispanics (41%) with at least a high school education, say that Latinos’ situation is worse. Similarly, Hispanics with household incomes of less than $30,000 (57%) are more likely than those whose household incomes are $30,000 or more (40%) to believe that things have gotten worse for Latinos in the past year.